Why Are Your Services is So Expensive? You want to know why is it expensive? First, no it is not expensive, when I charge you with my rates, it is within my tolerance for doing my services. I spent time learning my craft, I spent money buying all the tools that necessary, and I’m fixing your problem. Second, people never appreciate other people hard work, oh I’m sorry, I mean jerks never appreciate other people hard work. They think that other rip them off when it was so easy or just a few minutes done. These kinds of people never even think on how many years other spent to master that craft so they can fix the problem within minutes or hours. Third, I have bills and stuff that cost money too you know. That is why my fees are rated that way, so it can pay all the needs I need and I don’t have to panic each month not able to pay all the needs I had. When jerks not willing to pay my rates, I welcome them to find others that “probably” willing to do it cheaper, of course at your own risks. When you saw me fixing a few lines of code, or making some apps and games, I don’t stick my hands out and say “Abracadabra” and it’s done. I’m using all my years of learning and practicing so I can do those things. Never devalued your own skills by lowering your payment so you can satisfy a client. Instead, let them go, ask them politely to find another people to work for their problem. Never think that you were losing money, think it as you gain more money by freeing your time to find another client that appreciate your works and fees. When you let go a cheap client, you free your time to find a good client. 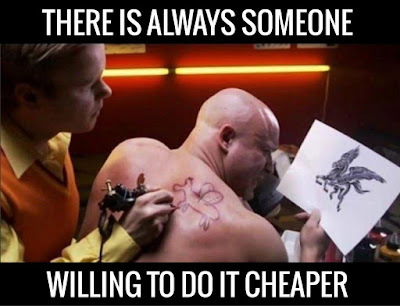 Ps: Yes, this can be applied to all kind of works, and yes, services is also billed.